Eliza loves cake decorating. She watches Sweet Caroline Cakes TV show with a passion, and wants to open a bakery with her best buddy, Tony. There's only one problem: they're eleven years old. OK, there's another problem, too. Eliza wants to take a cake decorating class at the community center. But it's expensive - nearly twice as much as other classes - and money's tight. Plus, her parents think she's a quitter. Eliza tries so many things, and she really wants to do them, but... after a few lessons or group meetings, she realizes they're not her thing. It doesn't help that she has ADD and that makes it harder for her to stick to things. 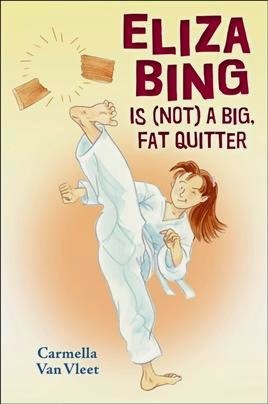 This is a fun book to read, and it might even make you want to head down to the nearest dojang (training hall) and try a few karate lessons yourself. It helps that author Carmella Van Vleet holds a third-dan black belt in tawkwondo, so the voice of the ninja-in-training is authentic. And it helps that she has drawn a sympathetic character in Eliza. And it really helps that she includes a pronunciation guide at the back, with "how to count to ten in Korean". Today I'm connecting with other bloggers who review mid-grade books at the Marvelous Middle Grade Monday round-up. And check out Carmella's blog here. *hana, dool, set, net, dasut, yasut, ilgop, yuldol, ahop, yul! Great minds think alike! I reviewed Eliza... this past week and share in your enthusiasm. Perfect book for new MG readers. how did I miss your review? heading over pronto! I have been hearing so many good things about this one! Thanks for featuring it--this is just the push I needed to read it for myself. I read about this book on another blog (can't remember now, unfortunately). But I love that she has ADD and that you learn how to count to ten in Korean. Great review. plus you can learn to say other things...not just count. You had me at "she wants to open a bakery"! Reminds me of my own kids, who also tried and quit lots of things before finally finding what they could be passionate about. So many kids try stuff and quit… it's challenge for parents to low how to address this!! I love that when she really finds her thing she's going to go all out to prove to her parents she won't quit. Great there's karate in there too. Appeal on lots of levels. This sounds like a winner. I will definitely check it out. Thanks for the review. I came across this one some time ago, and can't imagine now why it never made it to the top of my To Read pile. Something I think I'd better fix--thanks for the nudge on that! This is a new one to me! Sounds like a fun one! Thanks!